Recent essays. The nature of the Jew: "Only a Jew opts for Abraham--who questions--and for God--who is questioned." Autobiographical reminiscences of a friendship with Francois Mauriac. Apartheid in South Africa and the consequent moral dilemma faced by Jews there. A nightmarish return to Wiesel's childhood hometown in Hungary. 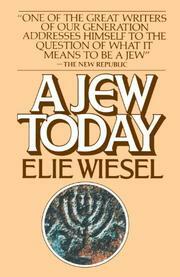 His Hasidic grandfather, shortly before the Holocaust, cautioning: "You are Jewish, your task is to remain Jewish. The rest is up to God." A lurid but effective quasi-fictional tale about a heretical convert who journeys to a transplanted Hasidic settlement in Israel after the Holocaust to explain that his heresy was designed to "punish" God for not saving the Jews. Best of all--and, as always with Wiesel, acerbic, accusatory, uncompromising--is a closing critique of our lately "desanctified" Holocaust literature. "Ask any survivor. He will confirm to you that it was easier for him to imagine himself free in Auschwitz than it would be for you to imagine yourself a prisoner there." Saying "Auschwitz, never heard of it" may be no worse than saying "Oh, yes, we know all about it." "Accept the idea that you will never penetrate the cursed and spellbound universe [survivors] carry within themselves with unfailing loyalty. . . . If you cannot communicate with them on their level, do not try to bring them down to yours." No cumulative effect but, with the Holocaust, a strong, inescapable impact.